On the 14th (Wed), kick back and relax at Sunayama Beach, enjoy the sand and surf at Yonaha Maehama Beach, and then tour the pleasant surroundings at Maipari Miyakojima Island Tropical Fruit Park. To find photos, traveler tips, more things to do, and tourist information, read Miyakojima attractions planner. Singapore, Singapore to Miyakojima is an approximately 10.5-hour flight. Due to the time zone difference, you'll lose 1 hour traveling from Singapore to Miyakojima. Prepare for a bit cooler weather when traveling from Singapore in November: high temperatures in Miyakojima hover around 30°C and lows are around 24°C. Finish your sightseeing early on the 14th (Wed) so you can travel to Ishigaki. Start off your visit on the 15th (Thu): explore the activities along Kabira Bay, then Head underground at Ishigaki Island Limestone Cave, then enjoy the sand and surf at Kondoi Beach, and finally look for gifts at Yurateiku Market. To find reviews, traveler tips, more things to do, and other tourist information, go to the Ishigaki tour itinerary planner . Getting from Miyakojima to Ishigaki by flight takes about an hour. 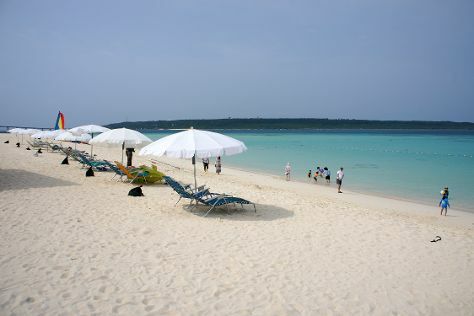 In November in Ishigaki, expect temperatures between 31°C during the day and 25°C at night. Cap off your sightseeing on the 15th (Thu) early enough to travel to Onna-son. Kick off your visit on the 16th (Fri): look for gifts at Yachimun no Sato, browse the different shops at AEONMALL OKINAWA RYCOM, and then explore the striking landscape at Cape Manzamo. On the next day, step into the grandiose world of Shurijo Castle, then make a trip to Shijo Hondori, and then buy something for everyone on your list at Ashibina Outlet Mall. For photos, traveler tips, and more tourist information, read Onna-son trip itinerary tool . Getting from Ishigaki to Onna-son by combination of flight and taxi takes about 1.5 hours. Plan for slightly colder nights when traveling from Ishigaki in November since evenings lows in Onna-son dip to 20°C. Wrap up your sightseeing on the 17th (Sat) to allow time to travel back home.